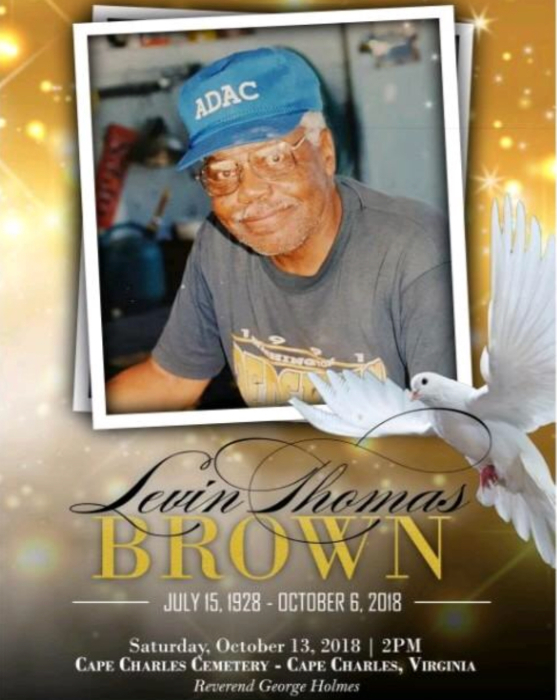 Levin Thomas Brown, affectionately know as "Baa-Baa" to family and friends, departed his life on October 6, 2018. He attended Deaf and Mute School. He was very known for his mechanic skills, which was self-taught most of his adult life. He took pride in working on cars and lawn mowers, until health declined. He leaves to cherish his memories: a devoted wife of 66 years, Ivory B. Brown of Cheriton, Virginia; four daughters, Oneida and Annette of Cheriton, Virginia, Barbara (Darnell) of Machipongo, Virginia, and Audrey of Durham, North Carolina; one adopted son, Authur Lamar of Plant City, Florida; one brother, Norman of Washington, DC; one sister, Yetta Weeks of Delaware; four grandchildren, Shatisha Rogers (Quincy) of Machipongo, Virginia, Shaun L. Brown (Domonique) of Cheriton, Virginia, A'niyah Johnson of Marietta, Georgia, and Tationna Johnson of Norfolk, Virginia; three great grandchildren, Demetria, Shaun, Jr., and Brieana; and a host of other family and close friends. The family would like to acknowledge the many acts of kindness expressed to them during this difficult time. May God bless each of you.